Erosion of high-traffic forest roads (i.e., mainline logging roads) is a large source of sediment in nearby streams. The fine-grained sediment generated by and transported from forest roads can adversely affect water quality and aquatic resources in logging-adjacent watersheds. Because of this, a project has been designed to help efficiently and effectively mitigate this sediment generation and transport from high-traffic, near-stream (HTNS) road segments. The project design includes the collection of extensive field data in western Washington, as well as the development of a theoretically-based model. This project is a collaborative effort among members of the Washington Department of Natural Resources (WADNR), Catchment Aquatic Ecology (CAE), Rayonier, the United States Forest Service (USFS), and the Watershed Dynamics Research Group at the University of Washington. The project consists of three main parts: the Major Experiment; the Parameterization Experiments; and the Modeling. The Major Experiment is designed to measure annual sediment load and quantify how forest road best management practices (BMP) that are put in place affect that sediment load. Our goal is to select and maintain 80 experimental sites, having 40 sites in each of two lithologies. Each site will consist of an 80 meter segment of road partitioned off by steel troughs and cross-drain culverts and will be equipped with a sediment tub, a tipping bucket, and a suspended solids tank. Site installation for 40 of the sites is expected to occur in spring 2018, and data collection will begin for those 40 sites in summer 2018. The Parameterization Experiments are designed to help answer six critical questions posed in our study design that are not necessarily answerable by the Major Experiment alone. We have six Parameterization Experiments planned: Ditch Line Hydraulics; Sediment Trap Efficiency; Cost Versus Maintenance Survey; Road Micro-Topography Evolution; Short-Time-Scale Interactions; and GRAIP/WARSEM Delivery Analyses. The Modeling component of this project is designed to create a model to accurately represent the sediment yield from HTNS roads, as well as the effects that select BMP have on that sediment yield. The model will be developed using Landlab, a Python-based Earth surface processes modeling toolkit. Schematic of a typical experimental site setup. Road cross-section depicting different Earth surface processes that will be incorporated into the Landlab-based model. Diagram depicting the interactions between all the components of the project. This research addresses an important gap in flood modeling: While the ability to model the hydrologic and hydraulic aspects of floods is mature, flood models do not sufficiently resolve sediment dynamics in river networks and related consequences for channel conveyance. Especially in tectonically active regions, changes in channel capacity due to geomorphic processes may sometimes be as or more important than the frequency of high discharge events in determining flood risks. The overarching objective of this project is to improve our ability to forecast flood and landslide risks by targeting the challenges associated with incorporating sediment sources and fluxes into flood prediction. Co-Investigators and collaborators: Alex Horner-Devine, Christina Bandaragoda, Nirnimesh Kumar, Jessica Lundquist, David Shean, Brian Collins, David Montgomery, Guillaume Mauger from UW, and Kris Jaeger, Scott Anderson, Eric Grossman, Erin Whorton (USGS), Jon Riedel, NPS. To accomplish this objectives, we are developing a holistic, process-based, mountain to coastline (M2C) modeling framework which will integrate hydrology, geomorphology and hydrodynamics models in a modular fashion across a range of process domains extending from hillslopes where sediment is primarily sourced to depositional environments where flood risk is impacted [Collins and Montgomery, 2011]. Upland and channel geomorphic processes are modeled using Landlab, a recently developed toolkit for modeling geomorphic processes. 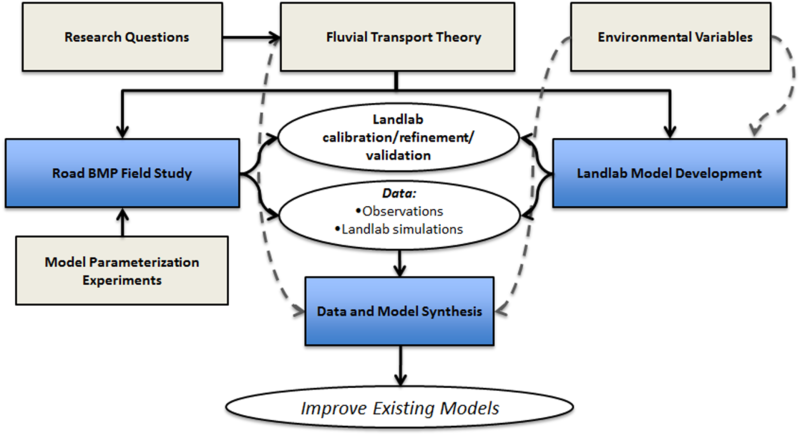 Landlab is also incorporated into an integrated flood modeling framework that includes hydrology (DHSVM) and fluvial geomorphology and flooding (Delft3D) models for the Skagit River and Mt Rainier drainage in WA. (1) What are the dominant geomorphic processes that lead to sediment supply and channel change in our study systems, and how they can be represented in the proposed model? (2) How do geomorphic processes, including landsliding, debris flows and channel storage, affect flood risk? (3) How will flood risk change in the future, given expected changes in geomorphic processes? Using a geomorphic approach (landscape topographic dynamics), we are developing new ways to predict probabilistic landslide hazard at regional scales using Landlab. The model applications are reproducible on HydroShare (instructions in the link). Our Monte Carlo approach connect uncertainties of the effects of vegetation, soils, and climatology on hillslope stability based on both the infinte slope stability model and empirical data. The products of these models include probabilistic landslide hazard maps that explicitly address uncertainty in site specific information. These maps and our approach can facilitate quantifiable risk assessments that can inform design and decision making in engineering, planning, emergency preparation, and resource management. We demonstrate our approach in the North Cascade mountains of Washington, where steep terrain, active tectonics, glacier dynamics, and high precipitation contribute to relatively frequent landslides. This research was funded by NSF, CBET-1336725. Probability of landslide initiation is illustrated with a figure on the left from Strauch et al. (2018): (a) high-resolution (0.3 m) imagery of a NOCA mountain compared to (b) P(F) simulated by modeled soil depth with mapped debris avalanches. Imagery from World Imagery, Esri Inc., created using ArcGIS® software by Esri. Existing sediment supply and transport models used for reservoir operations are based on simplifying assumptions that poorly represent extremely complex conditions in mountainous river and reservoir systems. The goal of our research is to develop a novel, continuous modeling approach to sediment supply and transport using state-of-the-art tools that allow for process-based representations of relevant and dominant geomorphic phenomenon driven by hydrology. Historic Elwha River landscape sediment supply and transport will be simulated using a new modeling framework for earth surface dynamics called Landlab driven by hydrology from the Distributed Hydrology-Soils-Vegetation Model (DHSVM). We aim for the model to reconstruct the accumulation of sediment behind the historic Elwha River dams of the Olympic Peninsula, Washington. When the Elwha River dams were removed in 2011 it marked the largest dam removal in history, and the dams had approximately 21 million cubic meters of sediment accumulated behind them. Retrospective analysis of this river and dam system allows the ability to test our modeling approach. We hope that this modeling appraoh can be used for sustainable planning and management of reservoir sedimentation in consideration of social and ecological factors along with changing climatic and environmental conditions. This research is sponsored by the Hydro Research Foundation, Northwest Climate Science Center, and NSF Graduate Research Fellowship Program.